Homeopathic duck liver prevents common colds…in your dreams! TODAY IS ‘WORLD HOMEOPATHY DAY!!! Let’s celebrate it by looking at the latest ‘cutting edge’ research on the world’s most commercially successful homeopathic remedy, Oscillococcinum®, a preparation of duck organs that are so highly diluted that not one molecule per universe is present in the end-product. It is therefore surprising to read that this new investigation finds it to be effective. According to its authors, the goal of this controlled observational study was “to investigate the role of the homeopathic medicine in preventing respiratory tract infections (RTIs)”. The ‘study’ was not actually a study but a retrospective analysis of patients’ medical records. It examined 459 patients who were referred to a respiratory diseases specialist in Italy. Subjects who had taken any form of flu vaccine or any other type of vaccine (immuno-stimulants, bacterial lysates, or similar) were excluded from the study. 248 patients were treated with the homeopathic medicine, while 211 were, according to one statement by the authors, not treated. The latter group was deemed to be the control group. All patients were followed-up for at least 1 year, and up to a maximum of 10 years. A significant reduction in the frequency of onset of RTIs was found in both the homeopathic medicine and untreated groups. 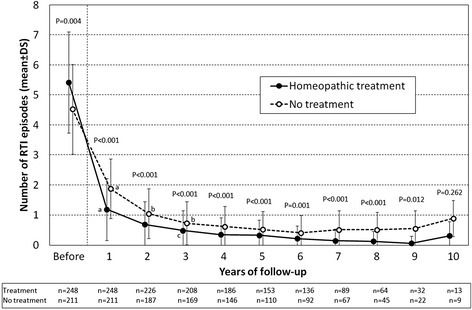 The reduction in the mean number of RTI episodes during the period of observation vs. the year before inclusion in the study was significantly greater in the homeopathic-treated group than in untreated patients (-4.76 ± 1.45 vs. -3.36 ± 1.30; p = 0.001). The beneficial effect of the homeopathic medicine was not significantly related to gender, age, smoking habits or concomitant respiratory diseases when compared to the effect observed in untreated patients. The number of infections during the follow-up period is plotted in the graph. The authors concluded that these results suggest that homeopathic medicine may have a positive effect in preventing RTIs. However, randomized studies are needed before any firm conclusion can be reached. The aim was to investigate the role of homeopathic medicine – why then do the authors draw conclusions about its effectiveness? Why were vaccinated patients excluded? This would skew the sample towards anti-vaxers who tend to be homeopathy-fans. A follow-up between 1 and 10 years? Are they serious? The authors tell us that “a total of 21 (4.6 %) patients ended the follow-up before 2012…” Did all the others die of homeopathic over-dose? Before the start of the ‘study’, patients had more than 5 infections per year. This is way beyond the normal average of 1-2. The authors inform us that “the primary outcome measure for assessing the effectiveness of the preventive treatment with homeopathic medicine was the reduction in the average number of RTI episodes per year versus the year before inclusion in the study.” This begs the question as to how the primary endpoint was assessed. The answer is by asking the patients or phoning them. This method is wide open to recall-bias and therefore not suited as a primary outcome measure. My favourite alternative explanation for the reported findings – and there are many that have nothing to do with homeopathy – goes like this: some patients did not comply because their condition did not respond to homeopathy. These were the ones who were, on average, more severely ill. They needed something better than a homeopathic placebo and they therefore became the ‘control group’. As the differed systematically from the verum group, it would be most extraordinary, if they did not show different findings during follow-up. So, is there nothing interesting here at all? BOIRON SEEMS TO DECIDE ON FUNDING AFTER HOMEOPATHICALLY DILUTING SCIENTIFIC RIGOR AND COMMON SENSE. 7 Responses to Homeopathic duck liver prevents common colds…in your dreams! To me, the most glaring problem with this study is its statistics. Anyone familiar with elementary statistics would look at the figure reproduced in the post and say: “Qué? !” Means with wide and overlapping standard deviations giving p-values of 0.001 and lower?! I looked up the original paper to see what statistics the authors had used. “The z-test was used for checking the skewness of scalar variables: number of RTI episodes reported at each year of follow-up, as well as the mean number of RTI episodes during the follow-up, displayed highly significant positive skewness coefficients (p < 0.001) and were transformed before analysis according to the formula log (x + k). On the other hand, the primary outcome measure (i.e., the difference in the average number of RTI episodes per year versus the year before inclusion in the study) showed a highly significant negative skewness (p < 0.001), and was accordingly transformed by the exp (x / k) formula. The values of the constant coefficients (k) that maximized the Shapiro-Wilk’s statistics for the normal distribution of each scale variable were chosen in the transformation functions." I cry "foul!" There is clearly no significant difference between those groups! This is not the only problem. They treated the number of RTI episodes as continous scalar: Quote: “The z-test was used for checking the skewness of scalar variables: number of RTI episodes reported at each year of follow-up, as well as the mean number of RTI episodes during the follow-up, displayed highly significant positive skewness coefficients (p < 0.001) and were transformed before analysis according to the formula log (x + k). " The point is one can not have 1.5 episodes. The number RTI episodes is an ordinal. I highly doubt the approach is statistically valid. All of these are quite indicative of the poor quality of the study, and thus things to look out for when you try to find out the veracity of the claims. However, it is important to remember that, even if they had shown a statistically significant difference between the groups with proper statistical methodology, the inappropriate design of the study would still have made that result irrelevant. I think you two know that, but I find it important to note in addition to your comments, because too many people confuse statistical validity with scientific validity. Oscillococcinum is indeed the canonical quack remedy. Its continuing existence is a bold testimony to the absence of any mechanism of self-correction in homeopathy: after it was shown that oscillococcus does not exist and flu is caused by a virus, remedies based on the purported oscillococcus bacterium would, in any reality-based system, have been discarded. But homeopathy has no objective tests, only confirmation bias, so it continues to exist despite the refutation of every single part of its purported basis. I was in the US a couple years ago and saw a packet of Oscillococcinum in the shelf of a pharmacy. I produced a blank piece of paper and was about to use that to “pay” for the packet with the argument that it was homeopathic money, the paper had been lying among banknotes shaking and shuffling in my wallet and was therefore potentised, just as the ducks liver. Maybe I was lucky cause I told my dear wife of my intentions to walk out with the packet and see what happened. She vetoed the idea. Her main argument was that it could get me into trouble with the law and that, I am told, is not so sensible to call upon oneself in the US. But why me? Could I be accused of fraud and swindle? Well, I have learnt the hard way through more than three decades to obey when the wife commands so I got cold feet. But the thought is intriguing, to have the police come and say I was breaking some law when the pharmacist is really the one who is deceiving the customers by selling sugar pills for sickness, right? Unfortunately your wife was correct. In America, the defrauding of customers is a far less heinous crime than depriving a fraudster of ill gotten gains. I think they could have gotten you for the filler.